An ETF delegation had a productive meeting with Spanish Secretary General for Transport María José Rallo. The ETF maritime section supported Spanish affiliates FSC-CCOO and FeSMC-UGT in their call to the Spanish Ministry of transport to increase crew complement on board of vessels involved in maritime Search and Rescue operations. The Spanish Secretary General for Transport also listened with great interest to the demands made on behalf of Fair Transport and its maritime component, the Fair Shipping Campaign. On September 19, a meeting was held between the European Transport Workers’ Federation (ETF) and the Spanish Secretary General for Transport, María José Rallo del Olmo. The ETF delegation was comprised of Philippe Alfonso, Political Secretary for Maritime Transport, and representatives of affiliated Spanish unions FSC-CCOO and FeSMC-UGT. The Spanish Secretary was accompanied by the General Director of the Merchant Navy and the Director of the Maritime Search and Rescue Agency, Sasemar. The meeting was convened in response to an ETF letter of complaint that addressed the hardships suffered by the staff of Sasemar due to understaffing and lack of adequate resources, both at sea and ashore in the maritime rescue coordination centres. The ETF delegation expressed its total support for the Sasemar workers. In addition, it called upon the EU and the Spanish Ministry of Public Works and Transport to find solutions for the problem of migration which affects both merchant shipping and the agencies responsible for carrying out maritime search and rescue at sea. The delegation reminded the Secretary for Transport of the need to ensure the appropriateness of the manning level onboard the Search and Rescue fleet, with a minimum security equivalent to the one before the economic crisis. This would allow ships to comply with international provisions regarding the days of work-rest, as well as optimising their level of operation. The delegation also asked for initiatives to guarantee a proper rest to crews that are continuously engaged in rescue operation involving migrants or other duties. The ETF recalls that maritime rescue workers are professionals who perform exclusive tasks of rescue and pollution surveillance. They should not be required to perform any task related to the surveillance or custody of migrants. 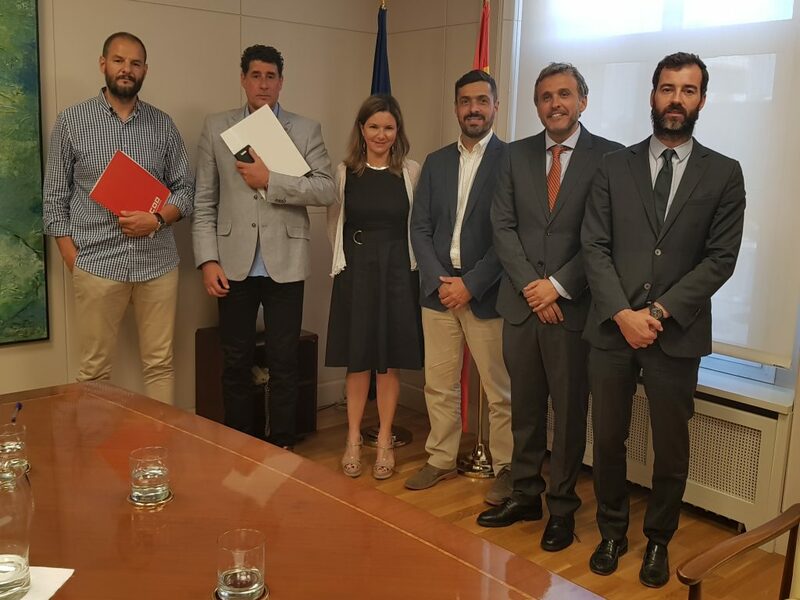 The ETF delegation used the occasion to brief the Spanish Secretary about the Fair Transport campaign and its mission to end practices of social dumping in the transport sector. A particular focus was placed on the maritime component of this campaign: the Fair Shipping campaign supported by all the ETF maritime transport unions and which strives for the creation of a European maritime space without social dumping, where fair employment conditions for all crew would apply. To halt the race to the bottom in the maritime sector, the Secretary was in particular urged to persuade shipping companies to register more vessels under first registries, in this case the Spanish flag, hence preventing the detrimental effects of flags of convenience. In this regard, it is telling that while 30 percent of Spanish maritime trade consists of crude oil and oil products, only a single oil tanker is flying a Spanish flag. The ETF will continue its efforts to create a European maritime space that is free of exploitation. Maritime work should be performed under conditions that are respectful of the human rights of everyone involved.